The sense of joy, playfulness and pure artistry in Mona Luison’s work embodies Picasso’s understanding of art as being innate and childlike. 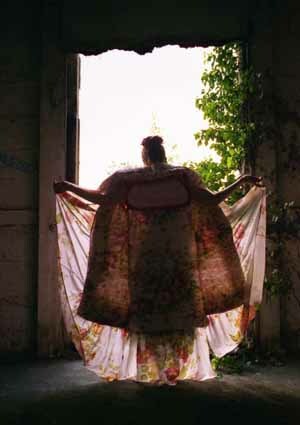 Her sense of worlds imagined, of naive creation, and of possibility, is palpable, through the depth and texture of her work. As Picasso himself said “Every child is an artist. The problem is how to remain an artists once he grows up.” Clearly Luison has solved that mystery through her creations. 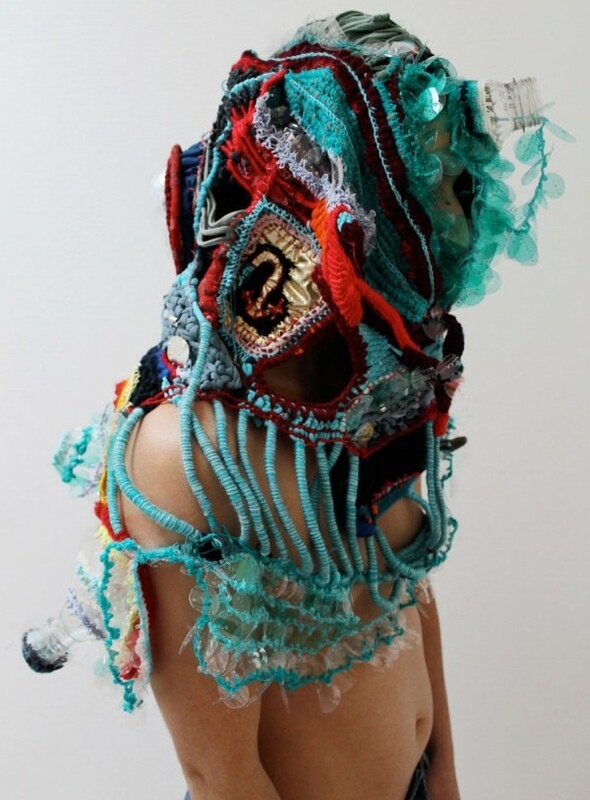 Her visual explorations are a delight to behold, a riot of color and materials, a stream of consciousness exploration of art through found materials and craft technique. 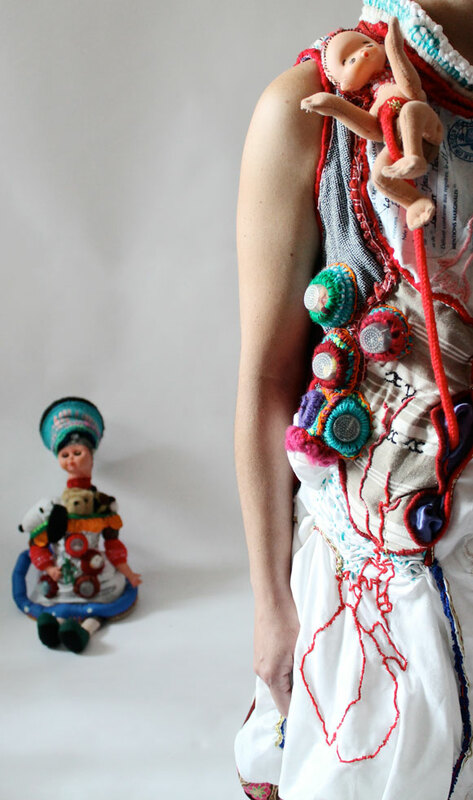 Working entirely from found and donated materials, the diversity of textiles, ephemera and found objects defy categorization. Her body accessory art speaks about the body through the manner her work is worn, the story of which is integral to her work; wearable history, our own and that of others. Initially working as a jeweler, under the name Tetsko, Luison created silver jewelry, but even from the beginning, her jewelry incorporated moving parts, as well as told a story. 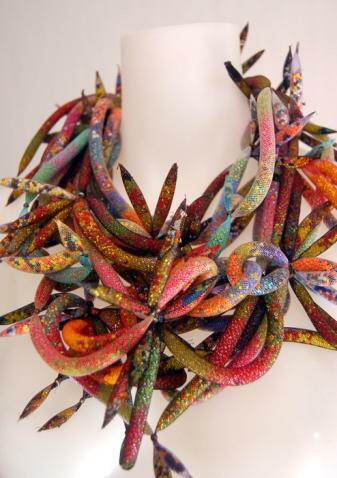 Adding additional items to her work, such as shots of graphic color from tin cans, she gradually extended the scope of her work to wearable art. 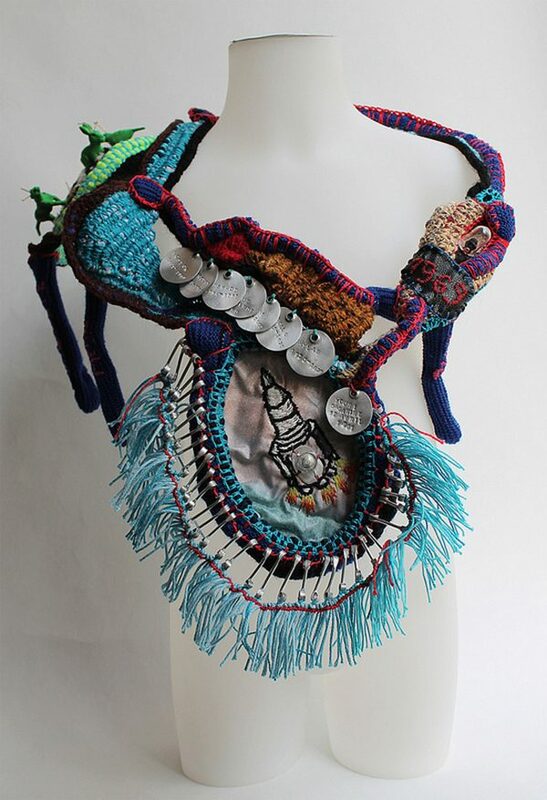 Her work is reminiscent of her art school projects, incorporating a freer sense of creation and art than she was able to incorporate through jewelry alone. Luison enjoys working with a broad variety and type of materials, and working through the reverse methodology of her jewelry practice, where an idea has to be fully conceived prior to execution, now working simply from an idea, and builds her body sculpture around that central concept, using the materials she has to hand, mixing jewelry with craft work, textiles and donated items that range from old clothes, coffee cups, tiny toys, bottle caps, and always incorporating embroidery as the means of bringing color to her work, weaving the diverse materials together into a whole, building a story, a history and telling a story through her process. Building her work like a sculptor, with the main creative force always being the body. Art house accessories label Hybrida, transforms recovered and discarded materials through design and craftsmanship, to produce a contemporary, avant garde collection of body accessories. Motivated to create beautiful objects, full of symbolic meaning, Hybrida infuse discarded materials with new value, prolong their life, and divert them from landfill.